Our latest products in the field of water transfer printing specializes in auto interior colouring with our special film and pattern. Our films have so many textures and patterns from camouflage - wood - marble stones and carbon fiber the choices are large and suitable for all kind of tastes. With our dipping tank system that makes the process so easy and quick for mass productions and meet the market demand of your shop. Our tanks are with many different sizes and control panels that keep the water process clean and water temperature steady and currant through out the process. Our activator that is used made from very clear chemicals that does not leave any stains nor residue when the process is complete. Our special spray guns used to spray the activators made from hi quality and the wright tools for the application. We use the best base coats and color coats while printing and the are environment friendly water base colors non toxic and oil free paints. Our top final coats are quick drying and solid that gives the printed object a shiny new bright look and prevents it from scratch to last a long time with non color fading. 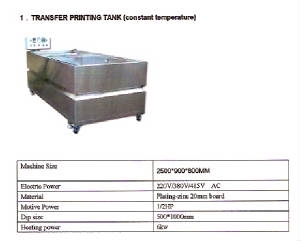 For more information please download the attached files and do not hesitate to contact us as we will be ever so glad to assist you in finding the right choice of water transfer printing package.